Another new place that we will visit today. 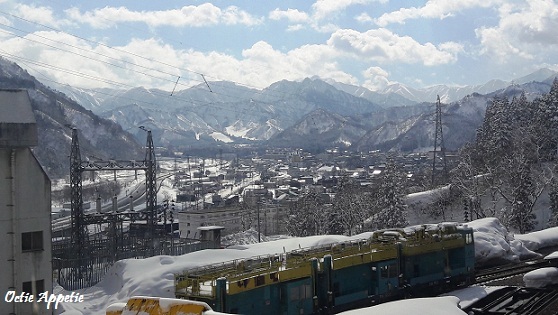 It is called Gala Yuzawa or the snow town resort, only 2 hours away from Tokyo by Shinkansen train. We bought the JR Wide Pass that can be used for 3 consecutive days. This pass covers unlimited rides in Tokyo and surrounding Kanto area. And the best to use for Mt. Fuji, Izu, Karuizawa, and Gala Yuzawa. 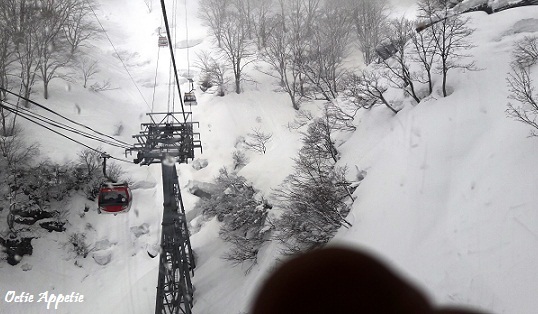 It costs alot cheaper and suit for a short trip travelers compared to JR Pass (only 10,000 yen/adult). 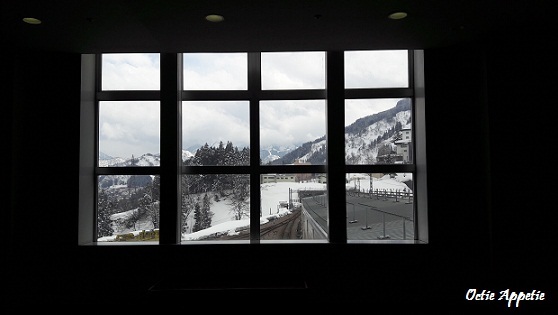 After picking up our rental gears and keep the unused stuff in the locker, we can go directly to Gondola station and head to enjoy the snow experience. It was mid of March, but up here is a totally different color from Tokyo city. 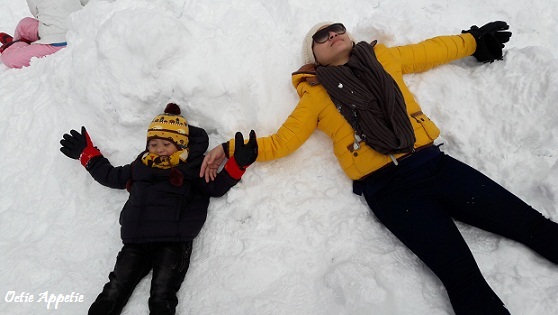 It is covered with white snow powder. 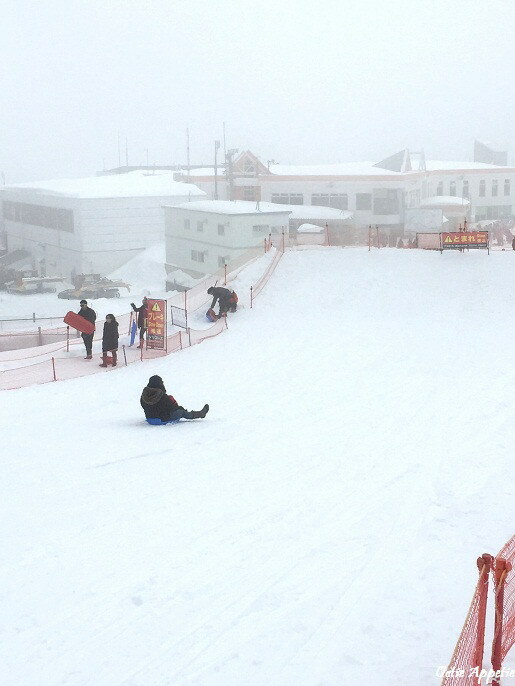 I had been to Perisher Blue in Australia before to play snow, it was an icy hard snow on the ground. But here in Japan, it is as soft as cloud and the snow flake won't stick on your fingers when you touch it. Try to lay your foot at the untouched snow on the side way and you will understand what I mean. There is a huge restaurant/food court just next to the snow area. Great place for hungry people and also made a nice place for taking some break. 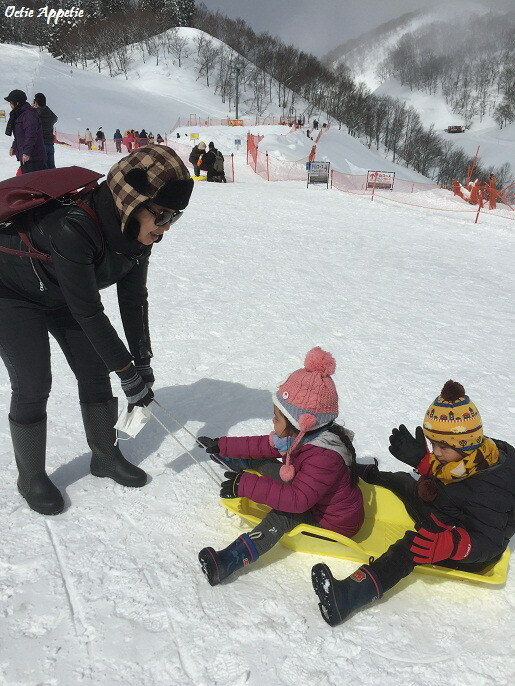 We only spent half day in this snow resort town, then we made a brief stop at Echigo-Yuzawa. Just one small tips from me if you go to snowy mountain, please bring or hire sunglasses as the reflection of the sun touch the white snow is so strong and hard for me to open my eye lid without sunglasses. 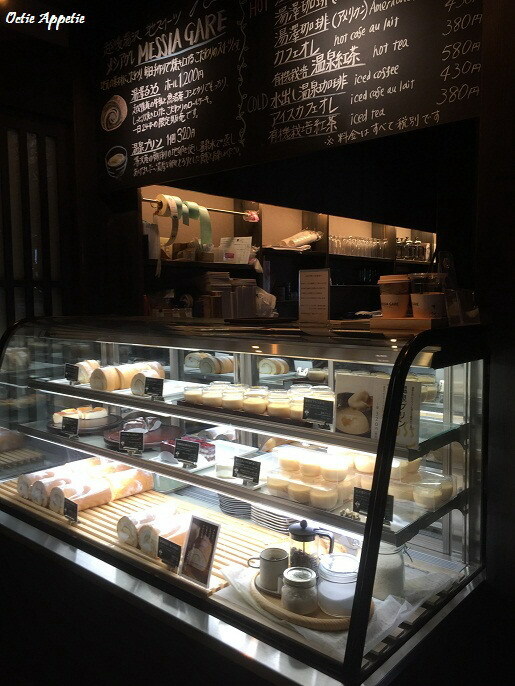 A nice cafe located just a stone away from Echigo Yuzawa station. 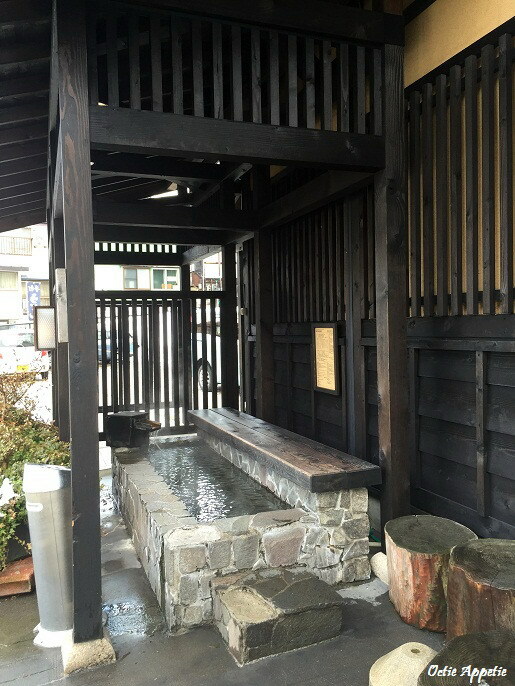 With foot bath in front of the shop that we can dip our tired feet into. 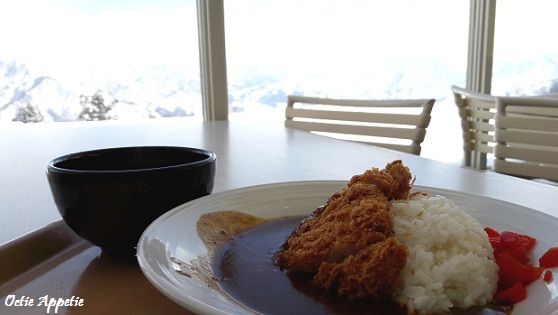 They serve an aromatic coffee made from hot spring water from the Echigo mountain and a-must-try cake roll. The cake was soft as pillow and not so sweet and I like the one with the strawberry better. We also tried their no-bake cheesecake and it tastes equally good. The house is like a traditional merchant wood house similar with the one you can find in Takayama. The interior is very nice too, Japanese style with a touch of modernity. 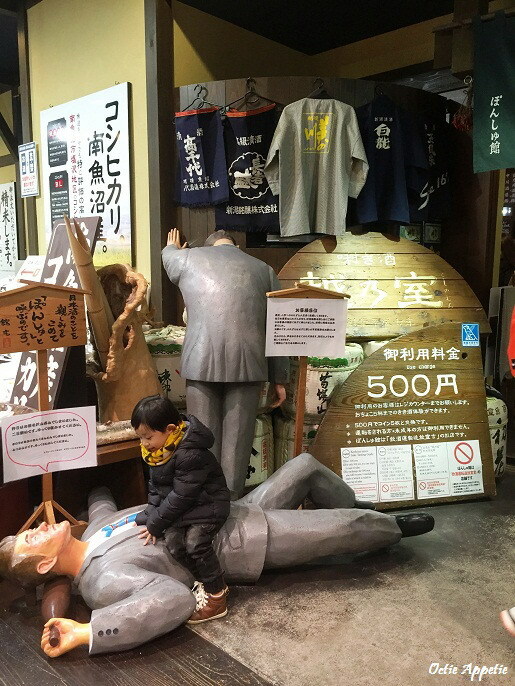 Before going back to Tokyo, of course we won't missed this Sake museum just inside the Echigo-Yuzawa station. Free entry, but for sake tasting we need to pay 500 yen for 5 tokens and one cup. It is a self-service sake machine. So what you need to do, first of all you need to decide which sake you gonna have out of 100 more different kind of sake to choose from. Then just put your cup in the place provided and put in the token accordingly (some only need one token or the better sake will cost more tokens). Then press the button and there the sake that you want will filled up your tiny cup and when it stopped, you can grab your cup and enjoy. There is a little description in each box and also the ranks of some of the top sake. After a long day, at night we just grabbed some quickey dinner. Opposite our hotel in Nippori, there is this self-picking dishes type of restaurant chain in Japan. Mine is actually more like a Japanese breakfast dish. But who cares, that perfectly fits with what I need at that time. Light and delicious. So Octie Appetie guys and will see you soon in the next blog.